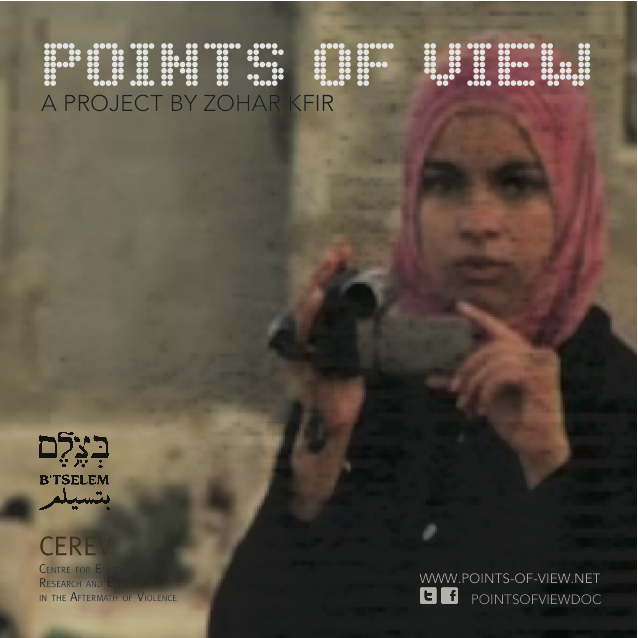 We are excited to mount Zohar Kfir’s Points of View documentary project in our Exhibition Lab from February 27 – March 6, 2014. The installation and both events will take place at the CEREV Exhibition Workshop in Concordia University’s J.W. McConnell Library Building, room LB-671.10. The lunch hour session will include a virtual conversation with project participants including Yoav Gross, B’Tselem’s Video Department Director. Open to the public, no reservation necessary. Points of View is an ongoing interactive web documentary project based on video footage shot by Palestinians working with B’Tselem בצלם’s camera distribution project. In 2007, B’Tselem began giving Palestinians living in the West Bank and Gaza video cameras as well as basic training in shooting and editing. Their hope was that the resulting video would allow Palestinians themselves to not only document the infringement of their rights, but also to present their the anger, pain, joy, and hope of their daily lives to both Israelis and to the international public. Point of View aims to increase exposure to B’Tselem’s important and unique project through the creation of a map based interactive documentary that both situates the footage in its location of origin and creates new narrative threads of meaning from the stories that emerge. Viewers can browse the clips randomly, or follow pre-determined video trails that are connected via events and tags. The video trails offer viewers a way to learn more about particular events or areas, but also allow them to make their own connections, creating non-linear narratives that resist the fixed conclusions that can be provoked by linear documentary filmmaking. Zohar Kfir is a Montréal-based video artist working with experimental video, interactive art and installation. She holds a MFA from Concordia University’s Studio Arts Programme and a MPS from New York University’s Interactive Telecommunications Program (ITP). Her artistic practice deploys non-linear narrative to cover a wide range of topics; from poetic meditations to documentary interventions. Zohar has shown her work internationally in galleries and at video festivals, including Transmediale [2003-2004]; NYUFF; FACT Liverpool; ICA Center for the arts in Boston; Jerusalem Film Festival; 56th Oberhausen Film Festival and a finalist at the Biennale Internationale des Poètes MAC/VAL museum, France. During 2013, Zohar received both Media Arts Canada Council for the Arts and a Vivacité Montréal (CALQ) grants to develop an interactive web-based documentary project, which explores Palestinian life stories and events.